This double eliminator has an inner and outer design. The inner double eliminator is capable of being engaged or disengaged with no tools required for adjustment. The outer double eliminator is non-adjustable. All corn shapes and sizes can be singulated with the double eliminator engaged. 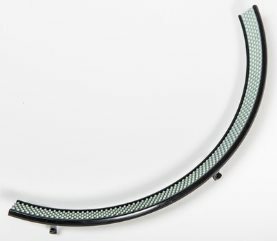 This important component of the meter needs no fine-tuning to leave one seed in each hole prior to the JOHN DEERE EXACTEMERGE™ PLANTER BrushBelt™ delivery system handoff. Soybeans can be singulated with the inner double eliminator disengaged. Another source for singulation used in corn is the rumble strip located at the bottom of the meter seed pool. The tiny bumps help agitate the seed as they are selected to the bowl seed disk. Due to varying seed shape and size of corn, this helps knock any doubles from each hole prior to reaching the brush-style double eliminator. When planting soybeans, the smooth strip needs to be installed as the seed shape and size singulates to each seed hole naturally. Uptime - Seed changeover has never been easier or quicker with ExactEmerge. If there is a little seed leftover in the mini-hopper, there are many effortless ways to clear the meter. 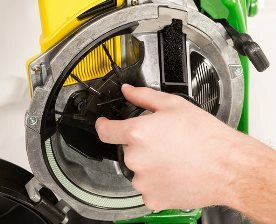 The JOHN DEERE EXACTEMERGE™ PLANTER ExactEmerge meters disconnect from the row-unit by one simple latch and disconnect the vacuum and Central Commodity System (CCS™) hose and remove the meter. The operator can then manually dump the excess seed back into a bag. Another option is the full planter runoff or individual row runoff. Lift the planter up, set a box under the row-unit, and let the planter empty the meters; just go and collect the seeds once they are empty. Once the mini-hoppers are empty, tools are not needed. Everything can be done with the operator’s hands. If switching to corn, the brush-style double eliminator needs to be engaged, the rumble strip needs to be installed, and the 32-hole corn disk needs to be snapped into place. For soybeans, disengage the brush-style double eliminator, install the smooth strip, and lock the 64-hole soybean disk into the meter, then plant. Easily achieve 100 percent population with no adjustments.